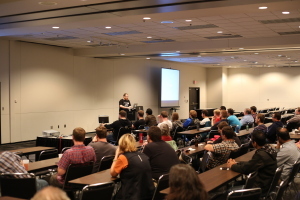 Madison PHP Conference 2014 was held on September 13th, 2014. 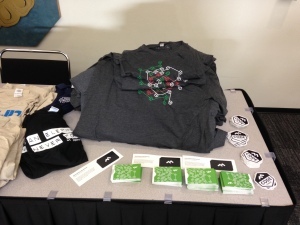 As one of the organizers, I saw a very different side of the conference than most attendees (which mostly means I ran around most of the day, and I did not get to see many of the talks). It was still an awesome time, though, and I absolutely loved seeing so many devs in one place focused on learning and getting to know each other.The venue this year worked out much better than last year. Last year’s venue was a nice space, but was too small for us. This year, we had plenty of breathing room and lots of space for the hallway track. 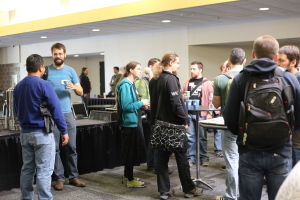 We left 30 minutes between talks, and that seemed to really help encourage people to talk to each other. We had 17 awesome speakers, including three from our user group who had never spoken at a conference before. I’d like to take a moment to say how extremely proud I am of (L to R) Vesna Vuynovich Kovach (@Vesna_V_K), Jason Endres (@tinyjason), and Mike Williams (@mikesmoniker). I’d also like to thank all of the speakers who took time out of their busy schedules to travel to Madison and share their wisdom with us. I loved getting to see all of you, and I hope to see you again soon! For the first time this year, we had a book swap and swag table. We brought in all of the extra swag we’ve been given at various other conferences or that had been mailed to our user group and set it out. We had a great table full of stickers, t-shirts, free trial offers, etc. The book swap table was for anyone to bring in tech-related books that they no longer wanted and they could put them on the swap table for anyone else to take – kind of the book version of “give a penny, take a penny”. 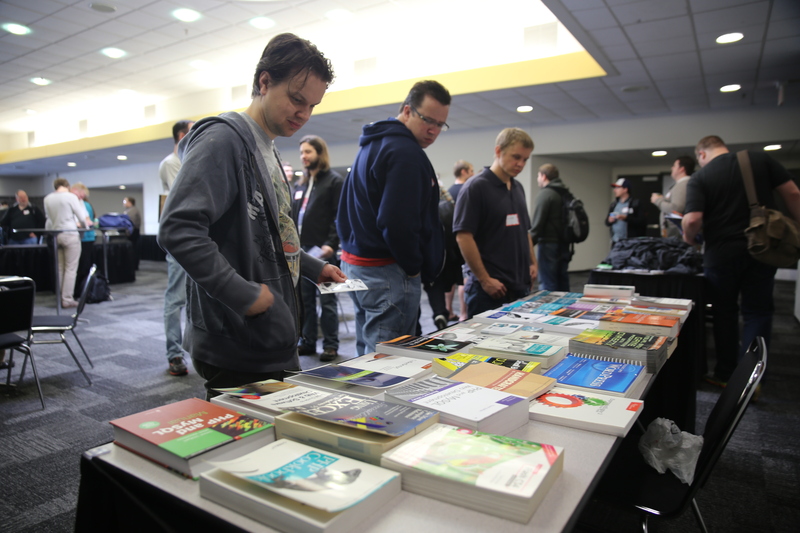 We had a lot of books come through, and we found homes for all of them except for a few which will be given away at future user group meetings. 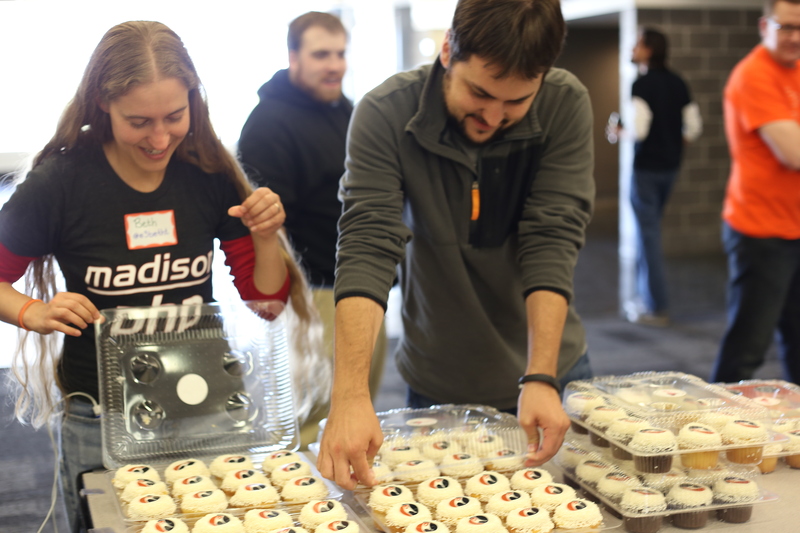 A definite highlight of the day was snack time with Rackspace cupcakes! We finished up the day with a closing keynote from Daniel Cousineau (@dcousineau), “Reframing the Problem” or “How to Think Like a Computer Scientist”. Daniel has posted a video of his talk on YouTube: https://www.youtube.com/watch?v=YDfYHS34D-4. After the closing keynote, we held a special event open anyone who wanted to attend (no ticket necessary). 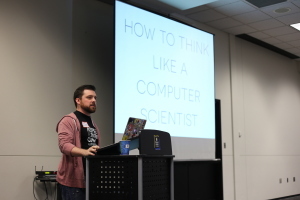 Ed Finkler gave his “Open Sourcing Mental Illness” talk followed by an open discussion with the audience. This is the third time I have heard Ed speak on this topic, and it was jut as powerful as ever. The discussion after was also very good. If you have not had a chance to see this talk, Ed has made the video of the presentation available on his website, http://funkatron.com/osmi.html. Please take some time to watch the video. 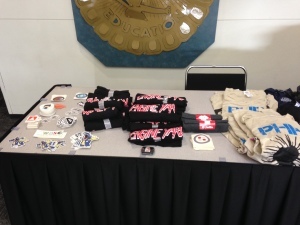 I’d like to take a quick moment to say an extra thank you to all of our sponsors: Constant Contact, Rackspace, ServerGrove, and php[architect], and especially to our local sponsors: Earthling Interactive, Web Courseworks, Midwest PHP Conference, Dragonfly Development, Beyond Usability, and Pinpoint Software. We so appreciate your support! I would also like to thank my co-organizers Andrew Shell (@andrewshell) and Ryan Wachtl (@ryanwachtl). Thank you for all of your hard work and for making the work fun! 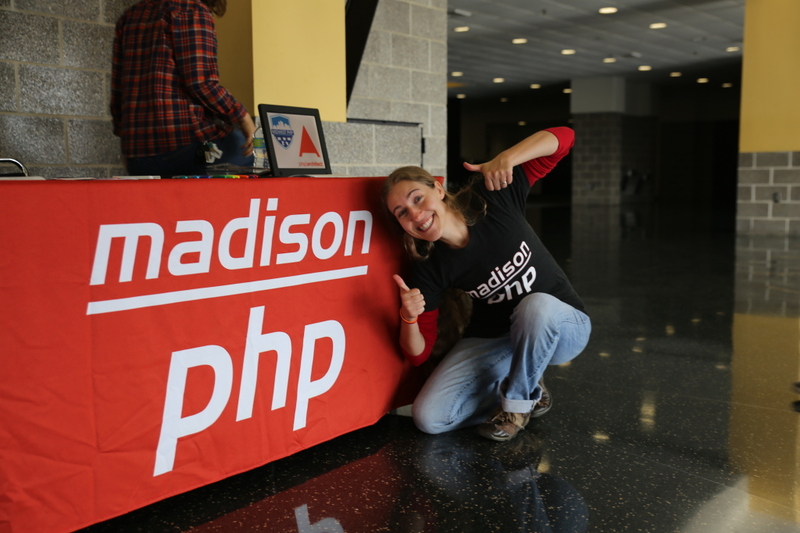 All in all, Madison PHP was an awesome day, and I can’t wait to do it again next year! Really enjoyed the conference, thanks a lot!